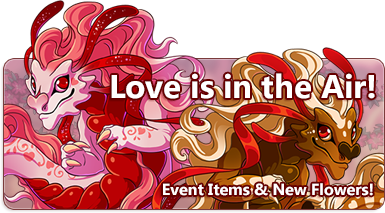 [center][permalink][img]http://flightrising.com/dropbox/updates/noggloggloggloggloggle.png[/img][/permalink][/center] Sweet event items and new flower colors are some of what you'll find in [permalink][b]today's update[/b][/permalink]! [more] [size=5][b]A Few More Flowers[/b][/size] We've expanded our flower lei sets to include[b] 5 new colors[/b]! The Larkspur, Dried, Silver, and Seapetal sets are now stocking in the treasure marketplace as [url=http://flightrising.com/main.php?p=market]individual apparel items[/url] and as [url=http://flightrising.com/main.php?p=market&tab=bundle&type=0]bundles[/url]. The Tigerlily sets are rare drops found exclusively in the Scorched Forest venue of the [url=http://www1.flightrising.com/coliseum]coliseum[/url]. [center][item=larkspur Tail Lei][item=larkspur wing garland][item=larkspur corsage][item=larkspur lei][item=larkspur flower crown][item=larkspur flowerfall][item=larkspur bloombox] [outfit=708242] [item=dried Tail Lei][item=dried wing garland][item=dried corsage][item=dried lei][item=dried flower crown][item=dried flowerfall][item=dried bloombox] [outfit=708249] [item=silver Tail Lei][item=silver wing garland][item=silver corsage][item=silver lei][item=silver flower crown][item=silver flowerfall][item=silver bloombox] [outfit=708246] [item=seapetal Tail Lei][item=seapetal wing garland][item=seapetal corsage][item=seapetal lei][item=seapetal flower crown][item=seapetal flowerfall][item=seapetal bloombox] [outfit=708251] [item=tigerlily Tail Lei][item=tigerlily wing garland][item=tigerlily corsage][item=tigerlily lei][item=tigerlily flower crown][item=tigerlily flowerfall][item=tigerlily bloombox] [outfit=708252][/center] [br][br][size=4][b]Love is in the Air[/b][/size] From now until February 21st at 12:00, the following seasonal items will be available, after which time they will cycle out until love is in the air once more~ [indent][b]Sweetheart Noggles[/b] are dropping from all enemies in [url=http://www1.flightrising.com/coliseum]the coliseum[/url] for the duration of the event. 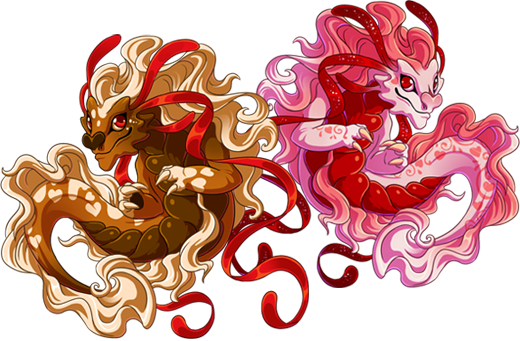 [/indent] [center][item=strawberry noggle][item=chocolate noggle] [img]http://flightrising.com/dropbox/familiars/vdaynoggle_large.png[/img][/center] [indent][b]Vista: Lovebirds[/b] is available in the [url=http://flightrising.com/main.php?p=market&tab=spec&type=0]treasure marketplace. [/url] [/indent] [center][item=vista: lovebirds][/center] [indent][b]Sweetheart Swan[/b] is available through [url=http://www1.flightrising.com/trading/swipp]Swipp's Swap Stand[/url] for 25 sparrow skulls and 20 Carpenter Wax. (don't worry, we've added this trade to swipp's pool multiple times over. So much so that you may get a bit tired of seeing swans this week! )[/indent] [center][item=sweetheart swan] = 25 [item=sparrow skull] + 20 [item=carpenter wax][/center] [indent][b]Enamored Swan[/b] is available through [url=http://www1.flightrising.com/trading/baldwin]Baldwin's Bubbling Brew[/url] for a limited time. Alchemists level 3 and above can bring this beautiful bird to life! [/indent] [center][item=enamored swan] = [item=copper muck]+[item=silver muck]+[item=orange goo]+[item=green ooze] [img]http://flightrising.com/dropbox/familiars/swan_large.png[/img][/center][br][br] [indent][b]Lovely Seraph Jewelry[/b] is available in the [url=http://flightrising.com/main.php?p=market]treasure marketplace[/url] as individual items and as a bundle[/indent] [center][item=lovely seraph anklets][item=lovely seraph armpiece][item=lovely seraph headpiece][item=lovely seraph hip drape] [item=lovely seraph necklace][item=lovely seraph tail bangle][item=lovely seraph wing ornament][item=lovely seraph jewelry] [outfit=324678][/center] [br][br][b][size=4]Trickmurk Circus Skin & Accent Contest[/size][/b] The fifth annual Trickmurk Circus will begin February 24, 2019, and we're running a skin and accent contest in celebration! [url=http://www1.flightrising.com/forums/skin/26312087] Click here for more information! [/url] [b]Please note the deadline is this upcoming Thursday. [/b] [center][url=http://www1.flightrising.com/forums/skin/2631208][img]http://flightrising.com/dropbox/shadow_contest.png[/img][/url][/center] [br][br][b][size=4]Coatl for Every Occasion[/size][/b] There are new emoji including coatl emoji available to use around the site. [center][emoji=heart] [emoji=gust] [emoji=coatl angry] [emoji=coatl confused] [emoji=coatl deadpan] [emoji=coatl happy] [emoji=coatl laughing] [emoji=coatl love] [emoji=coatl sad] [emoji=coatl scared] [emoji=coatl sleepy] [emoji=coatl star] [emoji=coatl tongue] [emoji=coatl winking] [emoji=cobra] [emoji=heart][/center] [b][size=4]Upcoming Micro-Holiday: [i]Springswarm[/i][/size][/b] [i]Flight Rising's[/i] third food-themed microholiday, [b][i]Springswarm[/i][/b], will be kicking off [b]Thursday, March 7th[/b] (06:00) and running until [b]Monday, March 11th[/b] (06:00). During this limited seasonal event, players will have a chance to collect [b]bonus insect food items as loot from all Coliseum battles[/b]. We'll also have a new pair of [b]familiars[/b] for you to grab! As with [i]Drakeharvest[/i] and [i]Frigidfin Expedition[/i], all [b]experience gains[/b] in the Coliseum will be [b]increased by 50%[/b] for the duration of the microholiday, so in addition to grabbing some extra insect items, you can level up some dragons! Sweet event items and new flower colors are some of what you'll find in today's update! We've expanded our flower lei sets to include 5 new colors! The Larkspur, Dried, Silver, and Seapetal sets are now stocking in the treasure marketplace as individual apparel items and as bundles. The Tigerlily sets are rare drops found exclusively in the Scorched Forest venue of the coliseum. A bundle of larkspur that wraps around the tail. A gorgeous string of larkspur to decorate the wings. A larkspur corsage, a gift from a generous someone. Dozens of larkspur in full bloom have been meticulously strung together to craft this beautiful lei. A crown woven from fresh larkspur. Made by a skilled nature dragon, this crown is enchanted to never wilt. A cascade of larkspur petals fall around you at all times: inexplicable! A bundle of dried flowers that wraps around the tail. A gorgeous string of dried flowers to decorate the wings. A dried corsage, a gift from a sweet someone. Dozens of dried flowers have been meticulously strung together to craft this beautiful lei. A crown woven from dried flowers. A bundle of silver blooms that wrap around the tail. A gorgeous string of silver blossoms to decorate the wings. A silver corsage, a gift from a sentimental someone. Dozens of silver blossoms in full bloom have been meticulously strung together to craft this beautiful lei. A crown woven from silver flowers. Made by a skilled nature dragon, this crown is enchanted to never wilt. A bundle of seapetal blooms that wrap around the tail. A gorgeous string of seapetal blossoms to decorate the wings. A seapetal corsage, a gift from an alluring someone. Dozens of seapetal blossoms in full bloom have been meticulously strung together to craft this beautiful lei. A crown woven from fresh seapetals. Made by a skilled nature dragon, this crown is enchanted to never wilt. A cascade of seapetals fall around you at all times: inexplicable! A bundle of tigerlilies that wrap around the tail. A tigerlily corsage, a gift from a charismatic someone. Dozens of tigerlily blossoms in full bloom have been meticulously strung together to craft this beautiful lei. A crown woven from fresh tigerlilies. Made by a skilled nature dragon, this crown is enchanted to never wilt. A cascade of tigerlily petals fall around you at all times: inexplicable! Sweetheart Noggles are dropping from all enemies in the coliseum for the duration of the event. A familiar with a sweet disposition. A noggle as sweet as you are! Vista: Lovebirds is available in the treasure marketplace. It smells as if it was soaked in... rum? Enamored Swan is available through Baldwin's Bubbling Brew for a limited time. Alchemists level 3 and above can bring this beautiful bird to life! These swans are easily entranced by each other and by reflective surfaces. A mysterious pile of orange goo. It is pulsating with an eerie internal glow and giving off the pleasant aroma of burnt rubber. A perplexing globule of vibrating green ooze. If left unattended, it may pick itself up and slink away. Contains the Lovely Seraph Anklets, Armpiece, Headpiece, Hip Drape, Necklace, Tail Bangle, and Wingpiece. 7 items. The fifth annual Trickmurk Circus will begin February 24, 2019, and we're running a skin and accent contest in celebration! Click here for more information! Please note the deadline is this upcoming Thursday. There are new emoji including coatl emoji available to use around the site. 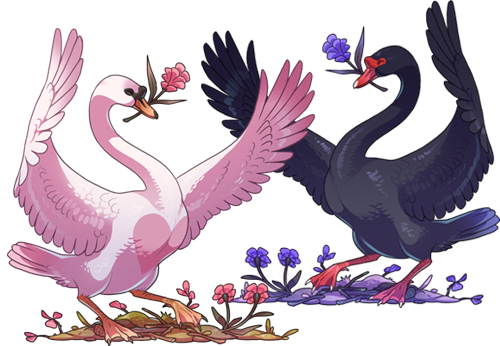 Flight Rising's third food-themed microholiday, Springswarm, will be kicking off Thursday, March 7th (06:00) and running until Monday, March 11th (06:00). During this limited seasonal event, players will have a chance to collect bonus insect food items as loot from all Coliseum battles. We'll also have a new pair of familiars for you to grab! As with Drakeharvest and Frigidfin Expedition, all experience gains in the Coliseum will be increased by 50% for the duration of the microholiday, so in addition to grabbing some extra insect items, you can level up some dragons! yes! I was waiting for a holiday for insects! These scavengers return to a Golden Idol with the trinkets they were able to collect. While they are at home in the water, hydrenas can often be seen skulking among the dust-parched boneyards of dead Greattusks, waiting to ambush overconfident hatchlings.